We Are Change UK in association with TruthAction London are pleased to present Richard Gage in London as a part of his Europe wide tour this autumn. Tickets will be on sale on the door and online (details to follow) for £5 (£4 concessions). We are certain there will be a high demand from UK based truth activists, and all are welcome and encouraged to come along, but we would like to ask you to do your utmost to bring at least one uninitated person with you and make this a night of awakening and not just reaffirmation. Keep an eye on this thread for further details. It's in our diary now anyway Gareth, thanks. Would have been good to get Richard touring right round the country but I guess he's not got the time. Will there be a media blitz on this talk? Trust that someone will be able to record/upload it. Although up near Liverpool and not able to make the event can I encourage any Truthers with a bit of time to compile a list of London Architects and engineers emails ready to ping them the Venue details as soon as thy are available. I am going to use yell .com as it often gives websites with email contacts on. I think the Architects and Structural Engineers Institutes websites have a "find an engineer/architect" section. Are the organisers looking for a venue still? iam wiling to film the event though my camcorder is not perfect, but its hi def. can the organiser/s make sure i can get in? ie reserve me a ticket or something? i think its important to upload the video. also does anyone know where the venue is exactly? or difficult to advertise it at last minute. 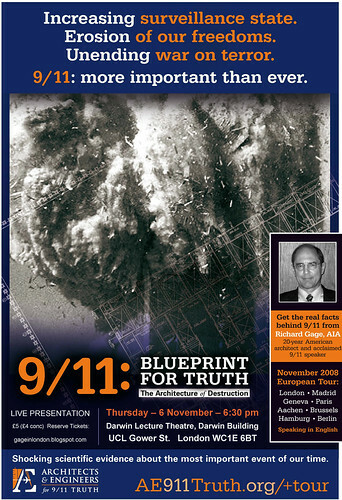 In case any of you have had your heads buried in the sand for the past year Richard Gage is an architect of 20 years who acted to form the international coalition of Architects and Engineers for 9/11 Truth. From a starting member list of one the group has grown exponentially and now numbers over 500 qualified professionals, calling together for urgent re-investigation of the three sky scraper collapses in New York on 9/11. The group has offered the kind of credibility the Truth Movement has strived for since its inception, and we hope you will support Richard's efforts by making your way down to London for the big event. But this should not be just another chance for a new sermon to the converted to be preached, or a chance for activists to rub shoulders. We will rarely have a better opportunity to convince those people we know who just will not come around to 9/11 Truth both of the validity of the claims and the importance of making a stand. We challenge you all to bring along at least one uninitiated friend, family member or colleague with you, as your own contribution towards expanding the call for truth across the globe. We have filming sorted out already, although of course you can make sure you get in, as detailed above. The organisers of the UK part of the tour are We Are Change UK and Truth Action London, although this has been organised as a Europe-wise effort by various activist groups across the continent. I trust anyone can film? Actually we've had word that ae911truth would rather no one filmed - they produce their own DVDs (and allow for them to be viewed for free on the internet) and like to keep tabs on the quality of the output. Do make sure the issue is raised at the start. Be sure Richard himself explains what he wants. This will avoid confusion on the day. Event has been announced as taking place from 6.30pm at University College London. I would expect that there won't be any control-freakery and that anyone who wants to can film the event. Covertly if necessary. I've also added a post on the AllinLondon website. I would expect that ............... anyone who wants to can film the event. Covertly if necessary. i was there tonight and i ,like everyone else could not believe that as soon as Mr Gage was being introduced ......the fire alarm went off and we all had to evacuate the building , which put the event off for 30 mins or so and meant that Richard had to run through a little quicker than i`m sure he would have liked . if Tariq ,who i was chatting with while we were waiting to go back in reads this, PM me it would be good to catch up at any more events that we are both attending ,cheers. Are we battling to get the truth out... against delinquent schoolchildren? Since the only UK date on this tour was marred, from a recording point of view, by a buzzing whine which carried on long after the fire alarm had been switched off. Here is a recent previous video of Richard's Blueprint for Truth talk. I trust the venue have compensated whoever hired the venue for all the disruption. Richard Gage represents five-hundred architects and engineers who demand a new investigation into the attacks of Sept. 11 in which the towers of the World Trade Center in New York fell in front of the eyes of the entire world. He has designed structures of steel buildings for over twenty years and insisted that there is an accumulation of "irrefutable" evidence that demonstrate that the Twin Towers and WTC Building 7 were demolished in a controlled demolition. Interestingly Annie, who was one of the organisers of this, the only Richard Gage UK event, informed me by email last Thursday that nobody would have been prevented from filming. I wonder why one organiser says one thing and another the opposite. Most peculiar on such a basically important bit of information about this crucial but disrupted (by two fire alarms) meeting. Richard Gage - superstar - this event was probably the best of the year - minus the whining noise in the background. The video clip on this thread is basically the same talk as he did in London.